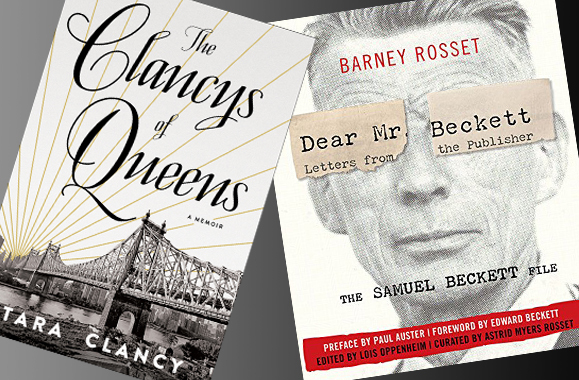 The Clancys of Queens and Dear Mr. Beckett are reviewed. Books of Irish and Irish American interest. In 1953, they met, or rather, collided, not unlike a pair of heat-seeking missiles in an avant-garde galaxy. It was in Paris (where else?) in the Pont Royal Hotel, the meeting set up by James Joyce’s publisher, Sylvia Beach. As Rosset recalls, “This very handsome gentleman walked in wearing a raincoat and said, ‘Hi, nice to meet you. I’ve only got forty minutes.’” Ten hours later, they were celebrating over champagne as Rosset (and his Grove Press) had acquired the American publishing rights to Waiting for Godot. The irrepressible Chicagoan and the quiet Dubliner soon moved from business partners to soulmates. In short order, “Dear Mr. Beckett” became “Dear Sam.” The two spent countless nights wandering the streets of Paris and even made a movie together, Film, with Buster Keaton. When Rosset was ousted from Grove, Beckett remained loyal, giving him sole rights to publish his last work. Rosset, in tribute to their kinship, named his son “Beckett.” Thirteen years after the writer’s death, he obtained his Irish passport, saying “I’m half-Jewish and half-Irish and my mother and grandfather spoke Gaelic.” In Ireland, he lectured at Trinity College Dublin, Beckett’s alma mater. Dear Mr. Beckett is a great counterpoint to the Cambridge University four-volume set, The Letters of Samuel Beckett, a work of intense scholarship detailing the dedication and precision Beckett put into his work. But, as Beckett was notoriously private, the reader needs to glean bits and pieces of his private life from the letters. The lighter and more intimate Dear Mr. Beckett manages to give us all – the artist, the man, and, especially, the great friend. In her heartfelt and engaging new memoir, The Clancys of Queens, Clancy writes of growing up in separate, wildly distinctive worlds. The first is humble Broad Channel, where Clancy’s cop father lived in the neighboring O’Reilly family’s old boat shed, the only place he could afford after her parents’ divorce. Bursting with such colorful stories and characters, The Clancys of Queens is a celebration – at times hilarious, occasionally unsettling – of ethnic Catholic New York, part Alice McDermott, part Goodfellas. But Clancy also travels out to the fancy environs of the Hamptons after her mother – divorced and working as a cleaning woman – falls in love with a successful businessman. Clancy comes of age shuffling between these worlds, which, though geographically close, sometimes seem as distant as Asia, Africa, and Antarctica. In the end, though, Clancy, a widely published writer as well as featured storyteller on NPR programs such as The Moth Radio Hour, is clearly a product of this melting pot, the kind of person who can comfortably inhabit different worlds and emerge to tell poignant, often dazzling, stories about them.